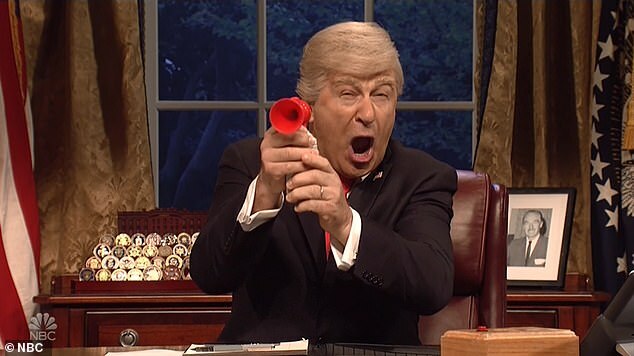 The Trump administration’s spin of the completed Mueller report was spoofed on Saturday Night Live, with Alec Baldwin returning as the embattled president and Robert de Niro reprising his role as Special Counsel Robert Mueller. SNL cast member Aidy Bryant debuted her portrayal of Attorney General William Barr, who in real life issued a four-page summary of the more-than-300-page report submitted by Mueller last week. Kate McKinnon returned as Trump’s lawyer, Rudy Giuliani. The sketch pokes fun at Trump's, Barr's, and Mueller's various interpretations of the report into alleged collusion between the Trump campaign and the Russian government. While Mueller is portrayed as methodical, diligent, and cautious, Barr is depicted as someone eager to whitewash any alleged wrongdoing by Trump. Trump, himself, is mocked as someone who can't be bothered with actually reading any of the Mueller report so he automatically jumps to conclusions that it are favorable to him. Baldwin's Trump tweets his exceedingly generous interpretation of the Mueller report. The three characters alternate with their individual spin on the Mueller investigation. 'Dear Attorney General Barr, officials from the justice department and esteemed members of congress,' Mueller begins his report. The camera then pans back to Mueller. 'On the charge of obstruction of justice, we have not drawn a definitive conclusion,' De Niro as Mueller says. The sketch reflects criticism by liberals who say that the attorney general gave a much more charitable interpretation of the Mueller report, allowing Trump to claim he was vindicated. The 'Russia, if you're watching' reference is a line that Trump, in real life, said during the 2016 campaign in which he publicly urged Russia to track down Hillary Clinton's emails. In real life, when Trump visited post-hurricane Puerto Rico in October 2017, he tossed paper towels to needy locals, prompting criticism that he was too glib about a tragic even that destroyed much of the island. In recent news, Trump has reportedly been urging his administration to cut funding to Puerto Rico. The SNL sketch continued, with Mueller saying: 'Somebody with the Trump team might have met with Russians at some point'. Trump was singing the lyrics to the Smash Mouth song All Star, which was released in 1999. McKinnon returned to SNL as Giuliani, who was vindicated by what the Trump administration views as a positive outcome to the Mueller probe. 'I guess I was a legal genius the whole time,' Giuliani says in the sketch. 'And all of my mind games worked. In a later sketch, Beck Bennett brought back his hilarious portrayal of Russian President Vladimir Putin. Bennett's Putin is seen convening a high-level meeting with military officials in the Kremlin. 'Have you heard the news out of America?' one of the army chiefs asks the president. Putin's top deputies have trouble coming to grips with the reality that Russia does not, in fact, control Trump. 'But if we had no blackmail why President Trump say such nice things about you?' one of the aides asks the president. 'I don't know. I think he just likes me,' Putin replied. The Russian leader then receives a special guest - North Korean ruler Kim Jong-un. Sandra Oh, this week's host, plays Chairman Kim's interpreter. 'Our glorious leader wishes to give you this valuable gift,' Oh says. In real life, Rodman, the basketball legend, has struck up a friendship with Kim. He is famously filmed breaking down in tears while singing Happy Birthday to the North Korean dictator. Putin tries to reassure Kim that there's more damaging information about Trump to come, particularly from the investigations being handled by the U.S. Attorney's Office of the Southern District of New York. 'That's where the real action is,' the Russian leader tells Kim. To which the translator replies: 'Glorious leader said you sound like Rachel Maddow right now. In real life, Maddow is the MSNBC host who has been criticized for using her nightly show to build anticipation among her audience that the Mueller report would uncover a Trump-Russia conspiracy to tilt the 2016 election. Barr's summary of the Mueller report, however, found that there was no such conspiracy. The 'poison those people in England' references the case of Sergei Skripal and Yulia Skripal, two Russian expats living in the United Kingdom who were allegedly poisoned with nerve gas on the orders of the Kremlin. In the SNL sketch, Kim is beginning to wonder if Putin is not as powerful as once thought given the Mueller report findings of no conspiracy. Putin replies: 'Give me some credit. I turn a lot of people blue! I do what most people think.